We are very excited to introduce a new programme of support called ELSA, which Manor Oak will be offering to our children. ‘ELSA’ stands for Emotional Literacy Support Assistant. At Manor Oak, we want our children to feel they are listened to and to give children who may sometimes be quieter, the opportunity to talk and be heard. ELSA supports children who may benefit from some confidence building, team/friendship building or a chance to talk about something which has upset them, such as losing a pet. Miss Jacob’s is our school’s ELSA and teachers have been asked to suggest any children they feel may benefit from this type of support. If your child is suggested by the class teacher, your permission will be requested before any sessions take place. Your child would work as part of a group once per week for 6 weeks and then their progress would be reviewed, before it is decided whether they will benefit from more support. 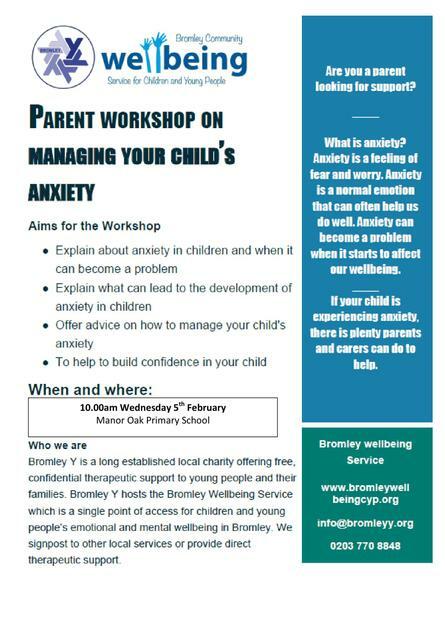 If you feel your child would benefit from support with confidence/self esteem building, friendships and social skills or someone to talk to about loss, please feel free to speak with their class teacher and they will request that your child is put on to the waiting list.